Fishing Bucket List Item Checked Off! This past year has been full of major changes that have drastically impacted the way I look at the world and my place in it. These changes, although negative at first glance, have had a positive impact on the way life is viewed though my eyes. In September of 2016 I was diagnosed with Stage 4A Head and neck cancer. At the same time while battling this horrible disease there were battles in my personal life that also took hold. My marriage was strained and it eventually ended. Many hours were spent sitting in my “cancer chair” at the house watching TV. I sat there just trying to accomplish the smallest of tasks. Feeding myself though a feeding tube or just trying to get rid of the nausea caused by the chemo treatments. The one thing that kept me going was thinking about hunting and fishing when I kicked this horrible disease. Well, I kicked it and can stand with my head up high and say cancer did not beat me, I beat cancer! That down time allowed me to think about all that I have missed out on or that needed to be accomplished in my life. A proverbial “bucket list” was created in the back of my mind and life would not be complete if I didn’t at least try to fulfil a few of these items regardless of the illness and life situation. This brings me to the actual point of why these words are penned upon these pages. Given the happenings over the year there was no way that there would be any missed opportunities. 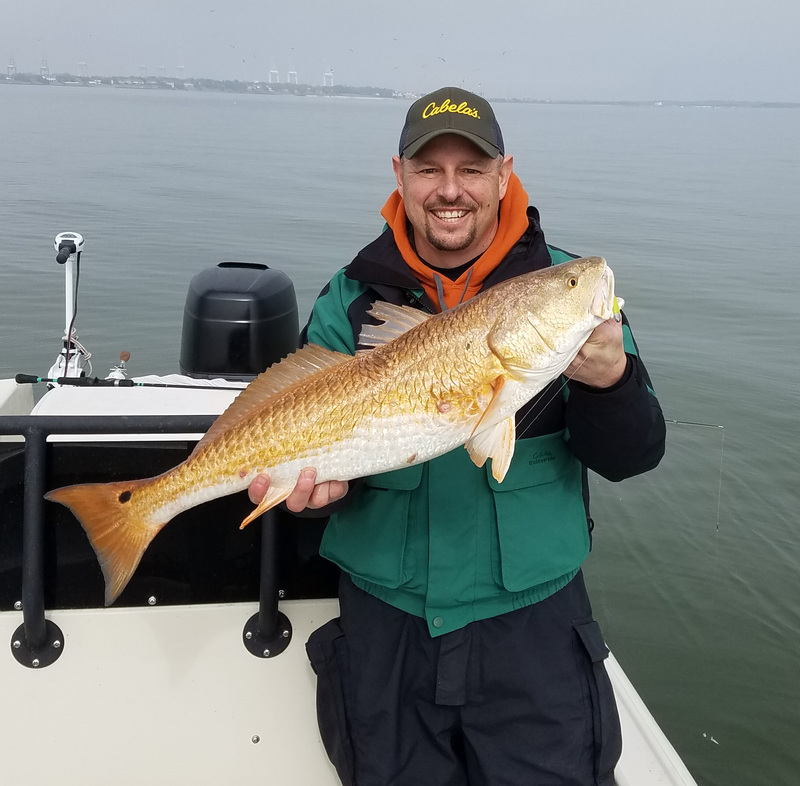 Thanks to a work trip to Houston and a few phone calls I was able to get hooked up with Captain Vince Garza of NPursuit guide service to hit the Galveston Bay area to chase Redfish and Speckled trout. For years my goal was to battle a big Redfish on light tackle and thanks to Capt. Vince this dream was about to be come true. I have chased many freshwater species in my career, but these saltwater brutes were up there high on my list to fish for. Being from Illinois these opportunities do not arise as often as my heart would desire. The winter here is spent drilling holes in the frozen lakes or trying to break ice with the boat to get out on Lake Michigan for trout and salmon. Of course, I was going to jump at the chance to fulfill a bucket list trip when the opportunity came up. After a few conversations with Captain Vince we were set to launch out of the Buddy Mcbride boat ramp in Baytown, Texas on a cold Winter Sunday morning. Winter in Texas this year has been a cold one and this was going to throw a little curve ball in the fishing, but fishing is always a challenge so there was no reason not to accept this one. The Captain showed up on time even though he had experienced a flat on the trailer. Not a good way for him to start his day, but it certainly told me that I was in for a positive experience that with this setback he was still on time and in a great mood. We have all probably seen fishing shows on tv featuring this type of fishing and usually it revolves around a client being handed a rod rigged up with a cork and live bait. This is not necessarily out of the question for me, but given the opportunity I would always prefer artificial lures over live bait any day. It keeps you active and requires more skill on both the part of the angler and the guide. Captain Vince shares this same view and I was overly excited to know that he strictly chooses to target these fish with light line and artificial lures. We were rigged up with 1/4oz swimming style lead head jigs tipped with Down South Lures plastic swimbaits. This was attached to a 20lb flourocarbon shock leader and tied onto a 10lb mono mainline. Using Waterloo custom baitcast rods and baitcasting reels with a high gear ratio of 7.3:1 we were set. 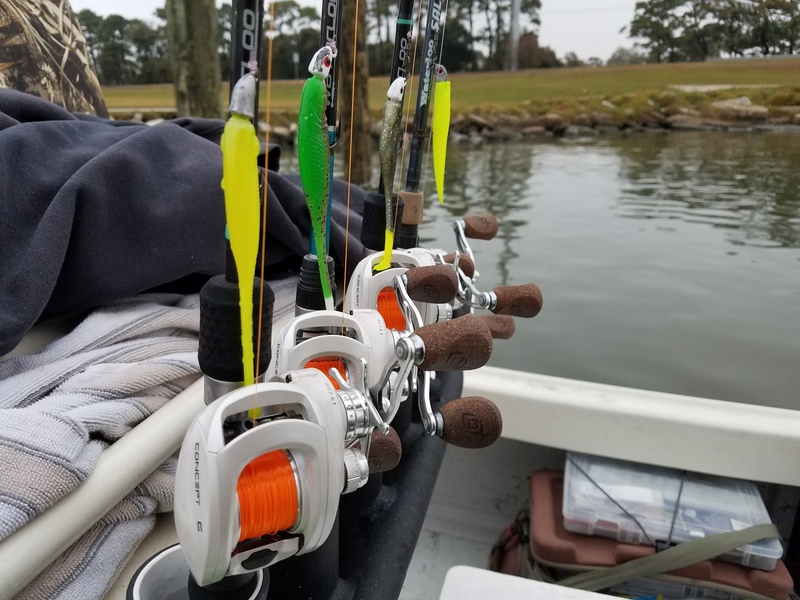 These rigs would be to serve us for chasing speckled trout as well as the bull redfish that were my main purpose for being on the water. The weather was certainly an obstacle for us in the morning as it wasn’t too far north of 40deg F for an air temperature and there was a heavy fog that made visibility very low. Our first spot was to hit a shell and mud flat that was a spot that had deeper water surrounding it and it topped out at about 5’ on top. Capt. Vince explained that these fish were looking for structure that would warm up faster than the surrounding areas. The mud and shells would warm up with the sun and thus get these fish moving. Much to our dismay the sun stayed hidden and the spot only produced a couple short strikes while we jigged and twitched our baits over the area. When the Captain said he wanted to make a long run for a different area I wasn’t about to argue. It was my turn to be the student instead of the teacher for a change. We ran through the fog and shipping channels and ended up on a reef in Trinity Bay. As we motored amongst the abandoned oil rigs we caught a strange scent in the air. It was the smell of watermelon and according to Capt. Vince this is the type of smell that the trout will give off as they are digesting their food. After chasing pods of feeding birds and some splashing bait we were unsuccessful at finding any feeding fish. To say at this point I wasn’t a little disappointed that we had not caught a fish would be a lie, however the experience on the water and all the things I had learned from Capt. Vince certainly made up for the lack of fish. It was interesting how many of my freshwater fishing techniques crossed over to this type of fishing. Looking for darker bottom during colder water conditions as well as changing up the cadence of your retrieves to trigger a reaction strike both made sense as this is often used in outings after come cold front conditions in search of fish on our Northern lakes. However, the day was not over and there was one huge lesson and experience that was in store. A flock of birds were starting to dive on bait in the water and while we watched it soon became apparent to me that there were more than just birds after that bait. The large red backs of the Red Drum started to break the surface of the water as shad started to flee. This then prompted the birds to dive and it was apparent that we had found a school of giant Reds. I knew we were in for some fun as Captain Vince’s voice became rapid and excited as he started pointing out the areas to cast while he worked the trolling motor to get onto these school. This school was moving faster than the 110lb MinnKota could keep up but the school turned and I was able to place a cast right where it needed to land and it was game on! The Waterloo rod loaded up and soon I was fighting a fish and then the captain hooked up. A double for our first hook up of the day. My fish dogged me hard and decided that he wanted to stay with the school. Taking long runs and running me around the boat a couple times made this for an exciting battle and by the time this fish hit the net I was giggling like a school boy. The captain had lost his fish, but I had accomplished the goal for the day and landed a monster 32” Red. In my opinion this was a trophy of a fish for a first of its species on my list. Some excited high fives, a hug or two with the Captain and then some nice photos of the fish and it was released to give another angler a fight another day. We kept up chasing this school by watching for the diving birds and then making long pinpoint casts at the areas that the fish were moving towards hooking up time and time again. The fish started chasing shad and then at one point we noticed shrimp leaping from the water as the fish herded them into tight schools. Catching these fish was only half of the excitement in this fisherman’s opinion. It was about the chase that made it exciting. Once you had one hammer your bait and double that rod over was just the icing on the cake. This was certainly a bucket list item that can be crossed of my list with a huge smile on my face. Some say that the recent hurricane that caused so much devastation in the area has affected fishing in a negative way. From what we experienced this day the fishery is very strong and has not been hurt by the recent events. The fish are there and they are huge. The numbers are up and the size is there to match wits with any angler that dares to tangle with these rod bending brutes. To this day I have a permanent smile on my face when memories of this recent trip come into my head. With all the struggles that have been put in front of me it was an incredible experience to say that I was able to participate in and cross this item off of that bucket list of things to do. I will be back and the next trip will be to chase Tarpon on light line with Captain Vince!